When quarterback Tim Tebow sat on the open market for weeks and months without any interest, rumors began to swell that his NFL career had come to and end after just three seasons. Not so fast, says Josh McDaniels. ESPN's Ed Werder first reported the news on Twitter that Tebow will sign with the New England Patriots to be a backup quarterback. As expected, Twitter has exploded since then. Tebow is expected to report to minicamp with the Patriots on Tuesday. McDaniels, New England's offensive coordinator, was the Broncos head coach in 2010 when the team selected Tebow in the first round (25th overall). One of Tebow's biggest supporters, McDaniels reportedly pushed hard for New England to land the 25-year old quarterback. 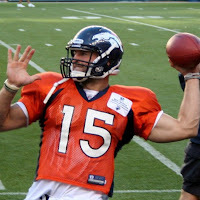 After starting the final three games of his rookie season, Tebow followed it up by helping the Broncos to several exciting victories in 2011. It was during this time that Tebow rose to the height of his fame in the NFL. Following the 2011 season, Tebow's Broncos knocked off the Pittsburgh Steelers in the Wild Card round of the playoffs, 29-23 in overtime. It was arguably the greatest moment of Tebow's pro career, as he threw for 316 yards and two touchdowns while adding another score on the ground. But Tebow's awkward release and inadequate passing skills ultimately led to his demise, as the Broncos fell to the Patriots the next week 45-10. Tebow completed only nine passes in the game and was sacked five times, earning a 52.7 quarterback rating. That was the last game Tebow would play for the Broncos. The following offseason, Denver landed free-agent quarterback Peyton Manning to a five-year deal and traded Tebow to the New York Jets. Tebow was rarely used in New York, however, attempting just eight passes in 2012. Now back with McDaniels and joining Bill Belichick, Tebow is expected to be groomed to again play quarterback—something the Jets seemed unwilling to let him do last season. And while he is not changing positions, Tebow may be used in special situations in New Englands offense (he was a goal line substitution under McDaniels during his rookie season). Tebow will get to play both of his former teams in 2013—the Patriots play the Jets twice this season and the Broncos in Week 12 on November 24. Terms of Tebow's new deal with New England are unknown, but it was likely a one-year deal. Update: CBSSports.com's Mike Freeman says the Patriots plan to use Tebow at tight end. Given his past experiences trying to catch passes, it remains to be seen how much Tebow will play TE. Update II: EPSN.com's Adam Schefter is reporting that the deal is for two years and includes no guaranteed money.